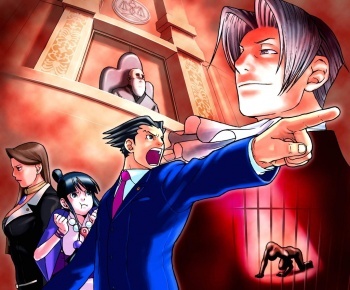 Is Phoenix Wright: Ace Attorney Coming to the Wii? An interesting listing on the website for the USK (Germany's equivalent of the ESRB) may be pointing fingers at an upcoming port of Phoenix Wright: Ace Attorney for the Wii. This listing seems to indicate that Capcom's table-slamming, finger-pointing courtroom adventure game - previously only available for the DS (well, unless you're Japanese and have the original GBA games) - will be making a console debut on the Wii, either as a port or (more likely) simply through WiiWare. The USK site already has listings for all of the Ace Attorney titles on DS, so it's unlikely that this is simply a matter of a snafu during the data-entry process or something along those lines. While it may seem odd to have this game's existence leaked by the German ratings board of all things, it wouldn't be the first time such a thing has happened: The USK inadvertently confirmed the existence of Guitar Hero: Van Halen back in April. Speaking personally, the first three Phoenix Wright titles are some of my favorite games in recent memory. Imagine, if you will, a courtroom drama a la Law & Order transformed into a crazy over-the-top anime where parrots and radios and ventriloquist dummies are called to the stand, and where at least one prosecutor has an unfortunate tendency to whip her opponents. Then transform that anime into a video game, and you'd start to have something approaching the awesomeness of the Phoenix Wright games (though Apollo Justice was a bit of a letdown). The writing was great, the characters were likable and funny, the cases were a blast to figure out (and I don't care what anyone says, the final case to Justice For All blows all of the others out of the water), and the soundtrack features some of the best videogame tunes we've heard in years. If the games are coming to the Wii (and one hopes that they will support Wii Remote deskslam/finger-pointing) then hopefully more people will get to play them and realize how awesome they are. No objections here, Your Honor!